Continuous investment in the latest CNC technology enables A&G to competitively produce and supply high quality precision engineered components for the aerospace, defence and high end manufacturing markets supplying Original Equipment Manufacturer (OEM), Tier 1 and Tier 2 customers. 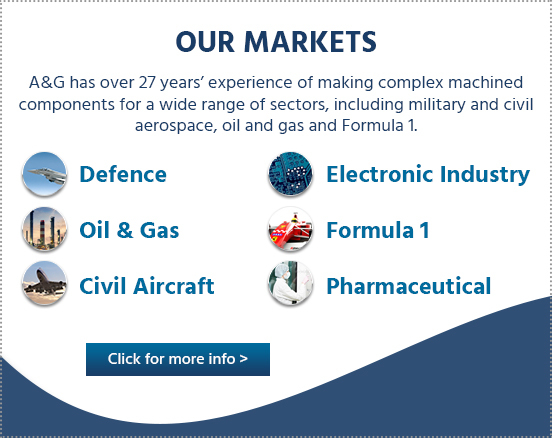 A&G are an SME operating in the Aerospace & Defence, Oil and Gas and F1 Automotive sectors. A&G is a self financed, family owned Business which now employs over 60 staff and has become an Integral part of the UK’s supply chain. In addition to existing State of the Art CAD/CAM Systems and significant 3, 4, 5 & 7 axis Precision milling and turning Capacity and Capability. A&G have further enhanced the CNC manufacturing scope with the recent addition of new 7 axis sliding head CNC Lathes and 5 axis machining centers. A&G operate a mature quality management System. Our operating processes are independently assessed and approved and are central to delivering on time in full quality products to meet all customers specifications. Quality systems are approved to ISO 9001 and ISO AS 9100 Rev C.